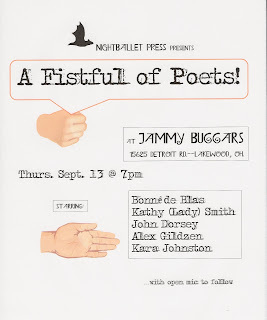 TONIGHT SEPTEMBER 13: NIGHTBALLET PRESS PRESENTS A FISTFUL OF POETS! Tonight's event A Fistful of Poets features five fantastic poets: Bonné de Blas with her excellent and unique poetry from The Act of Dwelling, John Dorsey with his brand-new chapbook of provocative poems and short stories, White Girl Problems, Alex Gildzen, freshly arrived from New Mexico, with his exciting NBP chap of travel poems and pieces, Passd Ports, Kathy "Lady" Smith with her much-anticipated new NBP chap that sparkles and snaps, Firecracker Mandalas, and Kara Johnston, with her sensitive and sensual poetry from Map Wrapping Paper Cradle Dangler. Kara's chap was published by NBP earlier this year, but this is the first time ever that NBP (and Clevelanders) will get to hear her read! All of these chaps will be available for sale both on this site and at the Fistful event tonight, September 13th. Jammy Buggars, located at 15625 Detroit in Lakewood, Ohio, has promised us our own bartender and our own server. We'll have our own entrance to the venue, as well. Come early and grab a chair! The food is wonderful, and you'll want to come hungry. This event will begin at 7pm! One night, five poets, good friends and excellent poetry in a venue that features delicious food, a multitude of draft beers, a welcoming ambiance, and unrestrained grooviness. Let the magic begin!